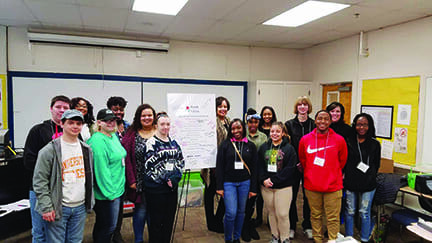 Project Grad Executive Director Ronni Chandler standing behind sign on the right and members of the staff and some of the 7000 inner city children served yearly by the 17-year-old program. Photo submitted. KNOXVILLE, TN — All over the nation, Seniors are preparing for the last few months of high school, all eyes are on them as they prepare for the rituals of prom, and graduation and in the Fall, many will begin their college journey. What happens to that student when they step on that campus all alone, cameras gone, trying to understand the process and procedures, financial aids, classes needed, or where to find help needed to ensure they reach that goal of graduation. If that student is a first generation student from an inner city school, the experiences they have that first year can hinder that chance of graduation. Not so for students who have participated in PROJECT GRAD in Knoxville Tennessee for the last 17years. The GRAD program which stands for, “Graduation Really Achieves Dreams”, began in Knoxville in 2001, is a partnership between public schools and the private sector. The K-16 program yearly serves 7000 low income inner city children of two high schools and middle schools and ten elementary schools. The mission of the program is to impact generational change thru education. The program has the heart of the student as its priority and from the students first kindergarten experience, provides activities, opportunities, access , scholarships and pathways to encourage, empower and provide aspirations for these students to complete post secondary education goals. They are a direct connection for the students during that critical first year of college, providing that much need resource and connection to ensure all questions are answered and all resources are provided for the student at the college they attend. The upcoming 2018 summer institute program titled, Hands on the Future has Project Grad partnering with the University of Tennessee Knoxville, Pellissippi State Community College, and The Tennessee College of Applied Technologies, Knoxville. They are also offering 15 paid summer internships with local businesses. These are but two of the examples of the programs designed to build awareness and empower the youths who are our future. Many of the students have returned to teach and serve in the community as teachers, business leaders, office holders, and several serve in other countries. All because they were given a chance from the moment they entered the school doors.